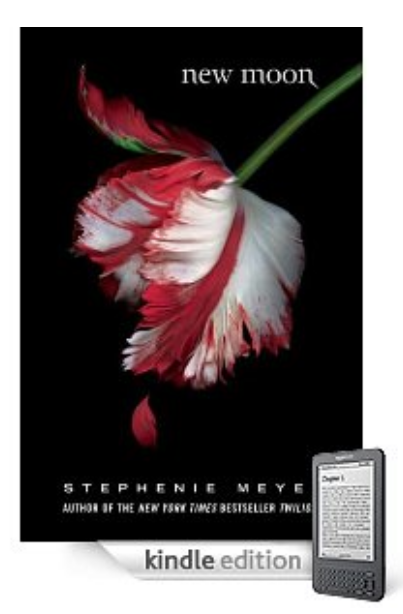 New Moon is the second book in Stephenie Meyer’s Twilight Saga. It is a really dark book, which makes it’s title, New Moon, very appropriate. It is $8.99 on the Kindle and Kindle DX. New Moon is a bit Romeo and Juliet-esque because it involves similar circumstances and depression. Bella celebrates her 18th birthday with Edward and his family. She ends up cutting herself to the point of bleeding and, as vampires, the Cullen family is overwhelmed with the desire to eat her. When they realize how much of a danger they are to Bella, they decide to move away. After Edward moves away, Bella suffers from a deep depression and seeks solace from Jacob Black. He and his tribe are werewolves. They protect Bella from various threats and revenge attacks. A bit of miscommunication becomes a matter of life or death for Edward, but will Bella save him in time? Sometimes I am shocked at the dark nature of young adult novels, but in a sense they do address major issues that teenagers today have to deal with. That includes depression and struggles relating to romantic relationships. New Moon didn’t get as good of reviews as it’s predecessor, Twilight, but here are a few I thought were interesting. Many complain about what a sap and over the top Bella is, but in a sense this is what teenagers can relate to. This entry was posted in Good Kindle Books At A Glance, NYT Best Sellers and tagged Native Americans, New Moon, romance, Stephenie Meyer, Twilight saga, vampires, werewolves, young adult fiction by holly. Bookmark the permalink.